Is my thumb really any "greener" than anyone else's...do I have a particular "gift" or talent for gardening? Clearly, I am not creating these magnificient flowers. I am not imagining these shapes or colors, like an artist painting a picture or a sculptor fashioning her masterpiece. 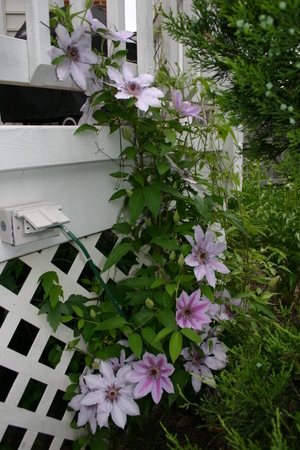 What is it about me that makes me a "gardener?" As I pondered this, it occurred to me that there are two primary things that I possess that contribute to the beauty of my garden. The first is a passion for flowers and the second is the willingness to get dirty. Simply put, I love flowers. I delight in flowers. I find a tremendous amount of joy in looking at flowers, caring for flowers, and watching plants transform from ugly tubers or seedlings into works of art. My family finds it alternately endearing and/or embarrassing that I often squeal with delight (yes, out loud) when I spot a particularly colorful display along our travels or notice a new baby bloom in our yard when we arrive home. The amazing fact that some also have a heavenly scent is just too wonderful for words. I love the varieties of greens that are found in God's imagination and the extraordinary vibrancy of the colors of His blossoms. I find pleasure in perusing garden catalogues, garden books, and garden websites. I enjoy doing research to find the perfect plant for that particular spot in the ever-changing, always evolving painting that is my garden. Except for being pregnant, gardening is the closest thing to participating in a miracle that I have ever experienced. Growing flowers, however, requires getting dirty. Flowers grow in dirt and playing in the dirt is messy. 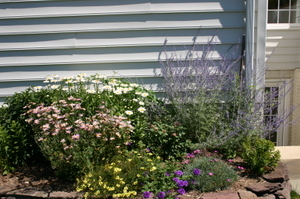 Digging, planting, pruning, weeding, mulching, feeding and watering will produce dirt, sweat, aching muscles and, eventually, hopefully, God willing, flowers. While generally fairly well groomed, I get very sweaty and very dirty when I am gardening. It isn't pretty, but it is worth it. 90% of the time, I am extremely happy while working in the garden, despite the sore muscles and dirty clothes. The other 10% of the time it is just hard work that has to be done in order to achieve the intended goal, so I grit my teeth and get it done. 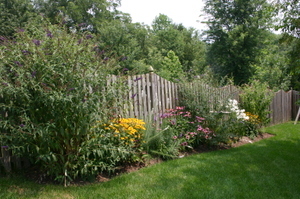 Sometimes, especially this time of year, I can't wait to get out in the garden and I am happy from the moment I begin. Other times, it seems a big hassle to change clothes, get my tools and gloves and set aside my other activities long enough to garden. Yet, once I get started, I lose myself in the task at hand and find the joy that I knew was waiting there all along. 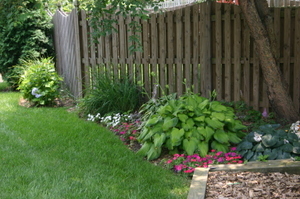 As the season progresses, the hard labor of the spring transitions into the maintenance tasks of summer. 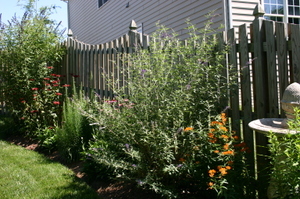 In the height of summer, a little weeding, a little feeding, and a little watering are mostly just good excuses to be closer to the explosion of flowers and the butterfly friends that they attract. Passion and a willingness to get dirty is all I really bring to the equation. 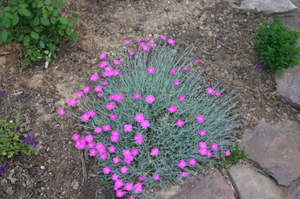 The transformation of ugly dirt into colorful blooms is entirely God's job. No matter how hard I work, I can't create a single flower. What I can do, however, is provide an environment where God can work His magic. Providing fertile soil, planting flowers in the appropriate aspect, making sure the weeds don't get too thick and the plants don't go too long without water are my attempts at participating in the miracle of creation. Because He loves me and He placed a creative spark within me, God allows me to get involved in the details of His masterpiece. 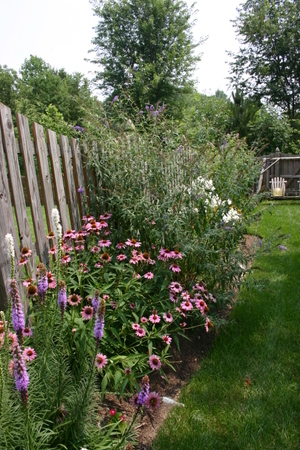 Would daylilies look good next to the coneflowers? 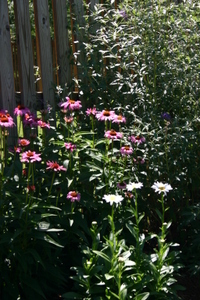 Which attracts more butterflies; shasta daisies or black-eyed susans? Can I possibly get away with another purple flowering plant without it just being ridiculous? Sometimes my experiments work out beautifully, other times I learn that certain plants prefer slightly different treatment and I choose to rip them out and move them to another place in my garden or dispose of them entirely. As I travel further down this gardening path, I become a little wiser, a little more experienced and a little braver about trying something new. Sometimes, despite my mistakes and neglect, something unplanned and unexpectedly beautiful blooms in the garden and I am reminded once again that I never really was in charge. I think my walk with the Lord is a great deal like my journey as a gardener. All I really bring to the equation is a passion for Him and the willingness to do the "dirty work" in my desire to be in His presence. Any transformation that takes place, any fruit that my life bears, is entirely His doing, His creation, to His glory. I can create an environment where I am more likely to see Him work His magic, but I cannot create one single beautiful flower on my own. Somedays, just like in the garden, the weather is fine and the work is joyful. 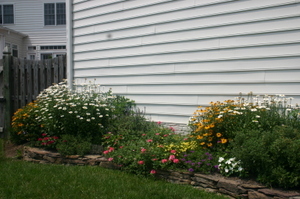 Other days, the work is just hard and messy...the weeds threaten and it is just too hot to garden. 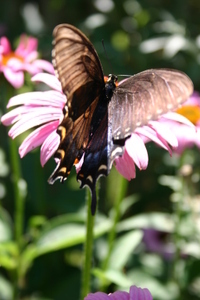 Yet occasionally, on those especially grace-filled days, in spite of my neglect, the flowers bloom and the butterflies arrive anyway. Some of my favorites are blooming right now AND we have robin babies on the way! Enjoy! I just wish you could also smell the lilac and peonies. Scratch and sniff blog? Many of my plants in my garden have gotten to the magic 3 or 4 years old and they are particularly gorgeous this year. All the rain we have had hasn't hurt either! I know that my mom and Katie are probably the only ones who really like my flower pictures, but the rest of you feel free to enjoy them as well! Next Tuesday dawned cold and rainy. Still, I had promised, and so I drove there. 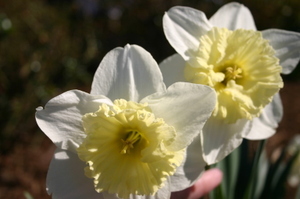 When I finally walked into Carolyn's house and hugged and greeted my grandchildren, I said, "Forget the daffodils, Carolyn! The road is invisible in the clouds and fog, and there is nothing in the world except you and these children that I want to see bad enough to drive another inch!" My daughter smiled calmly and said, "We drive in this all the time, Mother." "Well, you won't get me back on the road until it clears, and then I'm heading for home!" I assured her. "I was hoping you'd take me over to the garage to pick up my car." "How far will we have to drive?" "Just a few blocks," Carolyn said. "I'll drive. I'm used to this." After several minutes, I had to ask, "Where are we going? This isn't the way to the garage!" 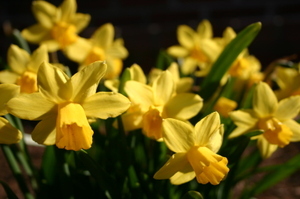 "We're going to my garage the long way," Carolyn smiled, "by way of the daffodils." "Carolyn," I said sternly, "please turn around." "It's all right, Mother, I promise. You will never forgive yourself if you miss this experience." We got out of the car and each took a child's hand, and I followed Carolyn down the path. Then, we turned a corner of the path, and I looked up and gasped. Before me lay the most glorious sight. It looked as though someone had taken a shimmering vat of gold and poured it down over the mountain peak and slopes. There were five acres of flowers. "But who did this?" I asked Carolyn. "It's just one woman," Carolyn answered. "She lives on the property. That's her home." Carolyn pointed to a well kept A-frame house that looked small and modest in the midst of all that glory. We walked up to the house. On the patio, we saw a poster. "Answers to the Questions I Know You Are Asking" was the headline. It's so pointless to think of the lost hours of yesterdays. The way to make learning a lesson a celebration instead of a cause for regret is to only ask, "How can I put this to use today?" Like many of you, we are a multiple computer household. 2 out of 3 of them are currently having "technical difficulties." The one in the playroom, primarily used by my younger daughter for instant messaging and email, won't really turn on most of the time. Well, it turns on, but you get that scary looking black screen with all that computer jargon that I don't understand. Last time I saw that screen, my hard drive had crashed and I had lost 2 months worth of un-backed-up pictures. OUCH! Luckily, there isn't anything of any great importance stored on that computer, so if it crashes for good, we will be OK. But what is a girl to do when there is a HUGE, IMPORTANT happening of some sort on Club Penguin and she can't get on a computer???? Much more importantly (to me, anyway :-) THIS computer that I am currently using is doing wierd stuff as well. I can't open certain websites that I can open on other computers, my Inbox in my email program has malfunctioned and ....HORROR of HORRORS....I can't seem to post pictures on my blog anymore!!! 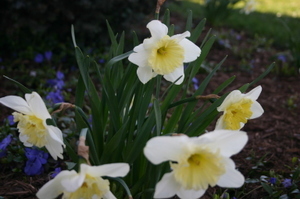 I have this awesome daffodil thing that I want to share with you and I have these beautiful pictures of daffodils currently blooming right here in my own garden and I CAN"T POST A PICTURE!!! So, you can see my frustration, right? I probably ought to call one of those computer geeks out here....no, really, they call themselves geeks, I promise....but I am really busy. The story of my life....I am really busy. See, my kids are in all of these plays; one in a play at school and both of them in a play at church. One play is the last weekend in April and one is the first weekend in May. Even though they are the ones in the plays, somehow, I keep finding myself in charge of stuff. My husband feels neglected, so he asked me to go with him on a business trip to Hawaii later this month. I guess he feels like he has to take me out of the continental United States to get my attention....that worked out pretty well for me, I guess! As I was telling a friend today, I almost talked myself out of going with him because of volunteer stuff I am involved in....isn't the beauty of volunteer work that you can make your own schedule? That is when you know you are too busy AND too impressed with your own indispensability....when you say no to free trips to Hawaii because you are worried things won't get done while you are gone!!! We started our new bible study this morning and it looks to be a great one. We are doing Priscilla Shirer's Discerning the Voice of God. Today's video was centered around John 10:27. This verse reminds us that "My sheep hear My voice, and I know them, and they follow Me." One of the things she said that really struck me was "do you think that He loves you enough to die for you, but He doesn't love you enough to speak to you?" She challenged us to anticipate that God does and will speak to us...that He wants nothing more than to have an intimate relationship with us....one that involves both listening to us AND speaking to us. I believe this is true. I have experienced God speaking to me in ways that changed my life. Yet, on a day to day basis, I find that many other things distract me from hearing His voice. In my rush to conquer that never-quite-finished to do list, I often talk to God on the run. Talking you can do on the run; listening is much more difficult. So I find myself praying the same prayers, asking forgiveness for the same things, wondering why I don't hear an answer or see a change. And I picture God, my blessing in hand, waiting for me to sit still long enough to receive it. My friend Katie talked about slowing down to spend time with God on her blog this week. I loved the Oswald Chambers quote that she shared...so much so that I am going to steal it! All God's revelations are sealed until they are opened to us by obedience...Obey God in the thing He shows you, and instantly the next thing is opened up...God will never reveal more truth about Himself until you have obeyed what you know already. I know the one area of obedience that I am always working on is spending more time with God...not on-the-run time, but sitting-still-and-listening time. I am grateful for the discipline of a new bible study to bring focus to that time and I pray that I will be faithful. God will never be outdone in faithfulness...when I am faithful just a little, He pours it on big! Speaking of God multiplying our faithfulness, I am going to post the thing I received from my friend about daffodils even WITHOUT the pictures of mine. Trust me, they are gorgeous! I have some thoughts for a new post brewing, but thought I would just post some garden pictures for tonight. 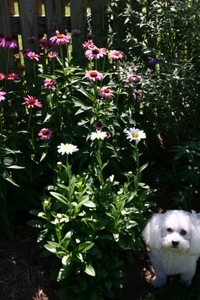 We are enjoying our summer and July is generally the peak month for my garden. 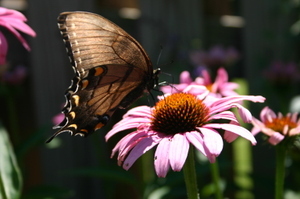 If you are a fellow flower or butterfly lover, click on the individual pictures for a larger version. Enjoy! It's been almost a month since I have posted...definitely the longest I have ever gone without writing in the almost 2 years (!!!) that I have been blogging. No real reason for my absence, or at least not one reason. Busy, nothing to say, too much to say....my life is full and blessed. God is good. Sometimes life is hard....not hard for me lately, but for people that I love. Yet, God just keeps being good. That's it, really...God's amazing goodness. It is so constant and consistent and unfailing. The scripture verse I keep thinking of lately is Philippians 1:6 (NIV): "...He who began a good work in you will carry it on to completion until the day of Christ Jesus." The Message version says "There has never been the slightest doubt in my mind that the God who started this great work in you would keep at it and bring it to a flourishing finish on the very day Christ Jesus appears." ...carry it on to completion...keep at it....God is not a quitter. What He has begun, He WILL complete. A flourishing finish. We can count on it. The beauty that I tried to capture in a vase in May, God could see in that scratchy looking dirt in April. 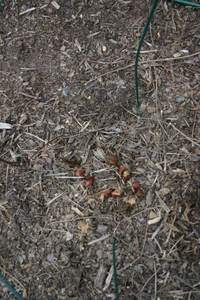 God, who is not limited by human sight, saw the fullness of His creation within those tiny, red buds barely sticking their heads through the chilly April soil. There was never any question that those small shoots would produce masses of glorious flowers that filled my kitchen for several weeks. It was their destiny. Even more beautiful than my peonies was my precious first-born sharing her Statement of Faith with the congregation on Confirmation Sunday a few weeks ago. The good work that God has begun in her, He is faithfully fulfilling. Through His grace, He has made her His own and He will carry that on to completion...a flourishing finish. It is her destiny in Him. Just this past weekend, she and God handled a difficult situation with so much maturity, grace and wisdom that I could only sit back and applaud His goodness....His faithfulness...His uncompromising generosity. The work He is doing in her life, in the lives of both of my girls, is the most beautiful thing that I have ever witnessed. He, of course, saw the fulfillment of His plan for their lives when they were still in my womb. He has begun a good work and He WILL carry it on to completion. 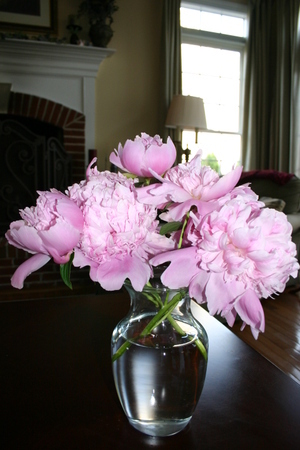 He sees the fullness of their beauty, just like my peonies, when He looks at them now...just beginning their journey with Him. If I believe that verse for my girls, then it stands to reason that is is true for me as well. And for my friend who is going through a time of heartache. And for my husband who is dealing with the stress of a new job. God has begun a good work and He will see it through to a "flourishing finish"...transforming each of us to be more like Jesus. It is our destiny in Him. Whatever it is, it is part of the process of becoming that which He intended for us all along. The way He already sees us. More beautiful, more complex, more intricate than the most glorious flower in my garden. My sister emailed me today to complain that I hadn't posted anything on my blog since the 20th of April. I told her that I was too busy playing in the gardent to blog. Yes, it is that time of year again. Garden obsession time! I didn't think it would ever get warm this spring. When it finally did, I have been spending loads of my time outside with my hands in the dirt. This time of year requires lots of hard work, but it is worth it. Clearing away the debris from the winter, getting rid of the weeds that are already trying to take hold, moving plants around as I envision how it will look 2 months from now...all part of the fun of waking up my garden. 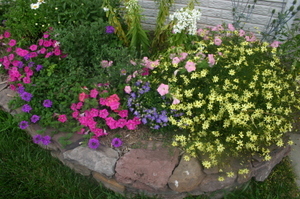 Over the last several days, I have been re-filling all my containers with a fresh crop of annuals. I spent several lovely hours at the garden store on Tuesday morning, had coffee with a dear friend, then spent the afternoon in the garden....pretty much a perfect day! Today is my grandmother LaVon's birthday. She is in Heaven now, but today is the 89th anniversary of her birth. She died 10 years ago, but I still miss her all the time. This is my favorite picture of the two of us together. It was taken in June of 1993. I was several months pregnant with my firstborn, her first great-grandchild, and they had come to visit us here in Virgina. 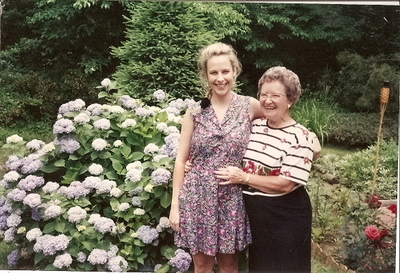 Grandma and I shared a love of flowers and I had recently begun gardening seriously. She was completely taken by this hydrangea bush in my yard and very excited about the impending birth of "our" baby, hence the hand on my tummy. You can see her spirit in the expression on her face. She loved the color yellow, a "happy" color she once told me. The smartest thing I have ever done was to give her one of those "Grandmother Remembers" books about 20 years ago. She completed it in detail and I take it out once or twice a year and read through it. I read through it again today, on her birthday. In her familiar handwriting, I find the essence of her captured in its pages. Her positive can-do attitude, her sense of joy in living, her commitment to family and to God, her pride in her husband, her children and her grand-children all come through in her words and the pictures that she shared with me. My grandmother and grandfather were of the generation that lived through the Depression. As I watched President Ford's funeral yesterday, another man of their generation, I couldn't help but think of the lessons they taught us. I tend to think that Tom Brokaw might be on to something with his "Greatest Generation" designation. This generation understood gratitude, sacrifice, and service in a way to which many of us can only pay lip service. My grandparents did not have a perfect life, but they had a very good life....a life lived in service to God, to each other, to their families and to their communities. Those of their generation, unlike many of the subsequent generations, were not obsessed with more...they understood the value of enough. Anyway, just thinking about Grandma today. Remembering her laugh, her applesauce, her sunny disposition, her clematis, her african violets, her tendency to say exactly what she was thinking without much filter :-)...and how very much she loved me. I'm sure all the grandchildren felt this way, but I always felt like she delighted in me. I love it when the bible says that God DELIGHTs in us...isn't that a great word? I want my kids to learn what it feels like to have someone delight in them from me....just like I learned it from my mom and my dear, sweet Grandma. I can't wait to see you someday, Grandma! Happy Birthday! Pictures from my garden! If you like the pictures, click on the small picture for a larger version. We are getting ready to go out of town for a while and I am always sad to leave my garden...it changes every day. Here are my first daffodils of the year! Since I took this picture on Saturday, many more have stretched open to greet us. I absolutely LOVE this time of year! 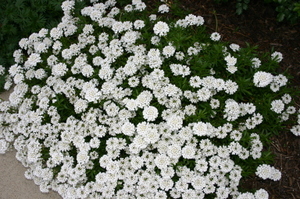 If you care nothing for flowers, you may want to visit my blog less frequently in the spring time. I suspect that my readers will be subjected to many more pictures of my garden and many more references to the parallels that I find between gardening and my walk with my Lord. 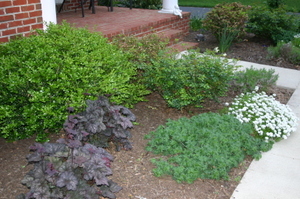 You may remember my entry back in October entitled Fair Weather Gardener. 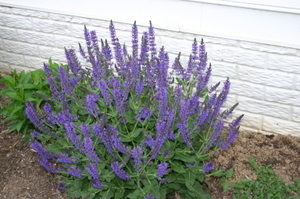 I warned you then that it is in my garden that I first started feeling the desire to put pen to paper (or fingers to keyboard) to chronicle my thoughts about the cyclical nature of our walk with God. I talked then about how the work we do in the fall, the unpleasant clean-up chores, prepares the way for the new growth that is promised each spring. The fulfillment of God's promises evidenced once again through the miracle of these tiny, new flowers! As exciting as the first daffodils are...and yes, I make everyone in my family ooh and aah appropriately in celebration of the first flowers of the year...I am just as excited by the things pictured below. If you can't see them well, click on the pictures for a larger version. I spent last Thursday afternoon clearing away the remnants of last year's flowers and this is what I discovered underneath. Tiny green shoots pushing their way through the hard ground. 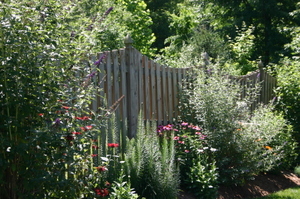 From now until the garden is in its full glory in June and July, I will go out, every few days at first and then every day, to check on the progress. Some days, the transformation is nothing short of a miracle. What you see here will become gorgeous flowers with very little help from me. Perhaps a little extra water, perhaps a little food in the form of a fertilizer, maybe a stake to hold up an especially enthusiastic bundle of blooms, but essentially, God will turn these patches of dirt into a thing of great beauty without my help. I prepare the soil, I clean away the debris, I feed them good things, I put supports around them to help them hold up their head on windy days but, no matter how hard I try, I cannot turn this patch of dirt and sticks into a beautiful flower. Hmmm...sounds like something else I try to "grow." Transformation, of ourselves, of our children and of our gardens, is God's work. Our work is to clean away the debris of the world, prepare our hearts through prayer, feed on wisdom through His word, surround ourselves with sisters and brothers in Christ to hold us up when the windy days come and trust God to fulfill His promise of transformation and new life. By the way, I got my love of flowers from my grandma and my mom. Today is my Mom's birthday and she is going to just love this entry on flowers! So Happy Birthday, Mom!! I love you!!!! This whole idea for blogging started back in April of this year (didn't actually start the blog until September; we'll talk about my issues with procrastination in some other, probably several other, entries.) The reason that I thought of blogging then is because I was in my "obsessed with my garden" season. Every year, springtime produces in me an irrepressible urge to stick my fingers in the dirt. I spend hours preparing the soil, poring over gardening books, shopping the local nurseries, and finally planting that year's new baby plants. Throughout the spring and into the summer, my family laughs about finding Mommy out in the yard "talking to her flowers." Throughout "garden obsession time" every year, my journal is filled with thoughts about the many parallels I find between gardening and my spiritual life. 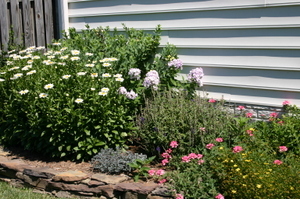 My friend, Mary, and I talked in bible study last spring about writing a book of garden meditations...hence, the beginnings of my thoughts on blogging. If I am still blogging next April, just get ready...I gotta million of them! Then comes late August and early fall. This is where the whole analogy starts to break down...or does it? My garden is looking pitiful right now. The weeds are taking over, the spent flowers need to be cut back, the whole garden is screaming of my neglect. 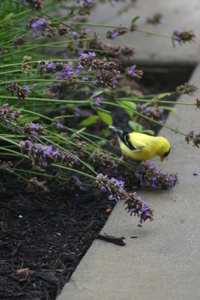 What happened to my gardening fervor? I keep thinking I'll wait until the perfect time to get out there and do the fall gardening chores and then that day just doesn't come. It is too hot or it is too wet....I don't want to get started now, I'll just get dirty and I have to go somewhere soon. You get the picture. It just isn't as much fun this time of year. I think you probably see where this is going. There are times in our spiritual lives when it just isn't fun anymore. That spiritual growth spurt we were experiencing last week seems to have disappeared. We don't feel that overwhelming sense of God's presence like we did last month. We can't hear God's voice when we pray and the bible passage we just read makes no sense at all. This whole God thing just doesn't FEEL as good as it did before. 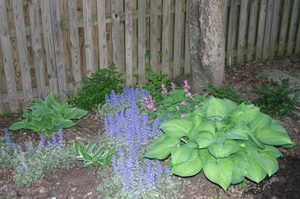 And since it's no fun, our spiritual life starts to suffer from the same neglect that my garden is experiencing. But, I think I am learning some things about tending my garden. The work I do today, even the decidedly un-fun stuff, is laying the groundwork for next spring. Clearing away the debris, pulling the weeds, cutting back the faded blooms are all necessary parts of the process of preparing for the next season of growth. And every fall that I reluctantly get my lazy, procrastinating self back out there and start working, I find there actually is some joy in the process. Not the springtime kind of joy; but a quieter, expectant, trusting-that-spring-will-come-again kind of joy. Without fail, spring does indeed come again and I am reminded of why I love gardening so much. So maybe there are some useful parallels to be found even in my fall garden. Perhaps it would be helpful to think about what weeds we need to pull or what debris we need to clear away the next time God seems far away. And maybe we have to learn to trust that the difficult, often monotonous work we must sometimes do in our relationship with God is part of the process of preparing for the next season of growth. For just like my daffodil bulbs that are hidden beneath the earth, He is always at work in us preparing for the next Springtime in our spirits.